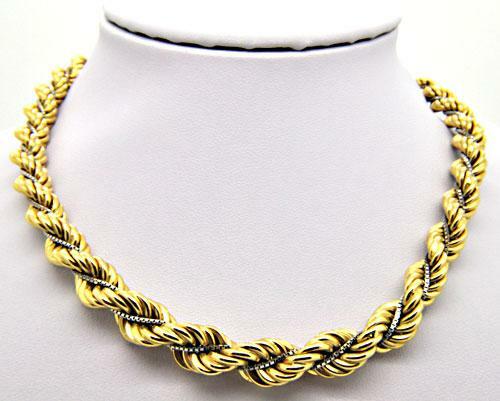 LADIES 18 KT TWO TONE GRADUATED ROPE CHAIN. IT IS A SOLID 18 KT GOLD WITH AN AMAZING WEIGHT OF 44.3 GRAMS. IT IS 17 INCHES LONG. WIDTH IS 10 MM IN CENTER AND 5.5 MM AT THE EDGES. HAS A LOBSTER CLAW LOCK. 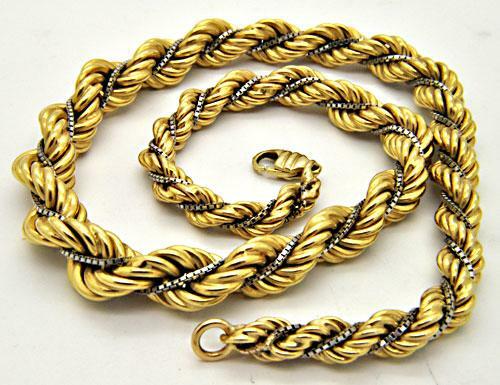 VERY ELEGANT AND DESIRABLE ROPE CHAIN.